The EU's Copyright Directive will be voted on in the week of March 25 (our sources suggest the vote will take place on March 27th, but that could change); the Directive has been controversial all along, but it took a turn for the catastrophic during the late stages of the negotiation, which yielded a final text that is alarming in its potential consequences for all internet activity in Europe and around the world. More than 5,000,000 Europeans have signed a petition against Article 13 of the Directive, and there has been outcry from eminent technical experts, the United Nations' special rapporteur on free expression, and many other quarters. Now, a coalition of more than 130 EU businesses have entered the fray, led by file storage service NextCloud. 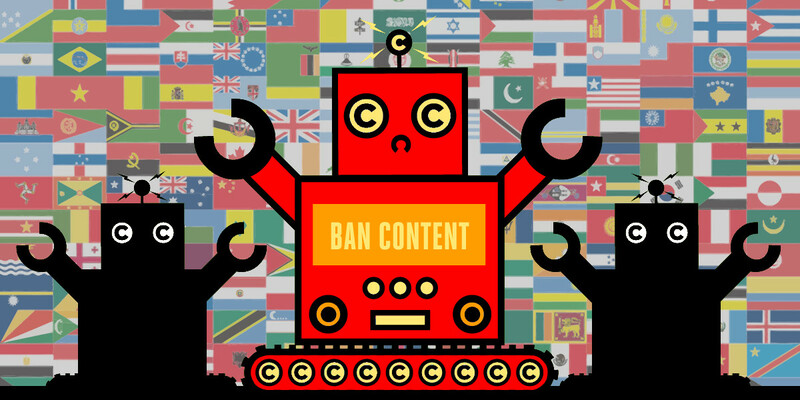 Their letter to the European Parliament calls Article 13—which will lead to mass adoption of copyright filters for online services that will monitor and block user-submitted text, audio, video and images—a "dangerous experiment with the core foundation of the Internet’s ecosystem." They also condemn Article 11, which will allow news publishers to decide who can quote and link to news stories and charge for the right to do so. Importantly, they identify a key risk of the Directive, which is that it will end up advantaging US Big Tech firms that can afford monitoring duties, and that will collect "massive amounts of data" sent by Europeans. March 21st is an EU-wide day of action on the Copyright Directive, with large site blackouts planned (including German Wikipedia), and on March 23, there will be mass demonstrations across the EU. Things are getting down to the wire here, folks. Here's the text of the letter; you can find the original, with the full list of signatories, here. The companies signing this letter to the European Parliament are urging you to vote against Articles 11 and 13 of the proposed copyright directive. The text of the trilogue agreement would harm the European economy and seriously undermine the ability of European businesses to compete with big Internet giants like Google. We support the goal of the legislation to protect the rights of creators and publishers, but the proposed measures are inadequate to reap these benefits and also fail to strike a fair balance between creators and all other parts of society. The success of our business enterprises will be seriously jeopardized by these heavy-handed EU regulations. Especially Article 13 is dangerously experimenting with the core foundation of the Internet’s ecosystem. Making companies directly liable for the content of their users forces these businesses to make billions of legal decisions about the legality of content. Most companies are neither equipped nor capable of implementing the automatic content filtering mechanisms this requires, which are expensive and prone to error. Article 11 is creating a completely new intellectual property right for press publishers. The experience with similar laws in Germany and Spain raises serious doubts about the expected benefits, while the negative impact would be very real. An additional layer of exclusive rights would make it harder to clear the necessary legal hurdles to start new projects. It will make entrepreneurs more hesitant to just launch new projects. Europe would lose any chance to play a significant role on the world stage. Startups that build services based on aggregated online information would go out of business, and every company that publishes press summaries of their appearance in the media would be in violation of this law. Although the purpose of these regulations is to limit the powers of big US Internet companies like Google or Facebook, the proposed legislation would end up having the opposite effect. Article 13 requires filtering of massive amounts of data, requiring technology only the Internet giants have the resources to build. European companies will be thus forced to hand over their data to them, jeopardizing the independence of the European tech industry as well as the privacy of our users. European companies like ours will be hindered in their ability to compete or will have to abandon certain markets completely. Given all of these issues it is noteworthy that the final trilogue agreement lacks meaningful safeguards for small and medium enterprises. The broad scope of this law would most likely lead to less new companies being founded in Europe and existing companies moving their headquarters out of Europe. For all those reasons we urge every pro-Startup politician to vote against Article 11 and Article 13. We hope EU lawmakers hear the concerns of these businesses and take them to heart. If you live in the EU, consider taking part in the day of action on March 21; and contact your MEP right now.